The National Trust for Historic Preservation released their most recent listing of America’s 11 Most Endangered Historic Places. This annual listing spotlights historical sites that are at risk of destruction or damage. 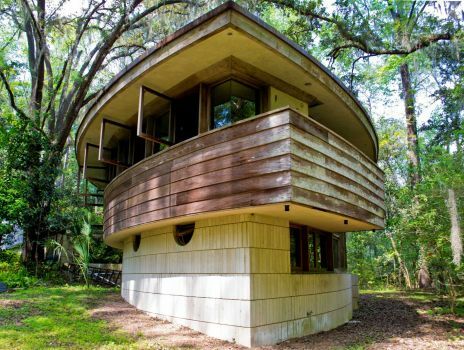 Included in this listing is the Spring House, the only private residence in Florida designed by Frank Lloyd Wright. The house, built in 1954, is characterized by both concentric and intersecting circles. The plan of the main bloc is composed of intersecting circles resembling a football or a boat. A circular form intersects the main bloc on its west side and houses the kitchen, bath, heating, plumbing, and ventilation facilities for the house. A wedge-shaped carport extends from the west side of the main bloc and terminates with a storage room. Most of the northern half of the house is clasped by a circular form containing a grass terrace. The Spring House Institute, a local non-profit organization, is planning to use this national recognition to launch a capital campaign to raise funds to purchase the property for preservation. The Spring House Institute has been working over the past few years to raise funds to preserve and save the Spring House, which has deteriorated due to weather and time. While the home is structurally sound, the facility is in dire need of new electrical and plumbing, as well as other repairs. The Spring House Institute aims to raise as much private money as possible by Halloween 2014. That’s when its application is due for a state historic preservation-matching grant. If the institute is able to raise $170,000, the project could qualify for a grant of up to $350,000 in funding, materials, and labor. The students and faculty of the Department of Art have had the privilege of working and studying at Tallahassee’s Spring House. Spring House is the only built private residence in Florida designed by Frank Lloyd Wright. One day Spring House will be used for a broad spectrum of classes, workshops, seminars, and other cultural events. But much fundraising needs to be done to realize this ambition.